In a couple of ways, Dubai is one of those destinations that offers up a two-in-one vacation experience. For starters, it’s a place where rugged is juxtaposed with luxe in the best way possible. 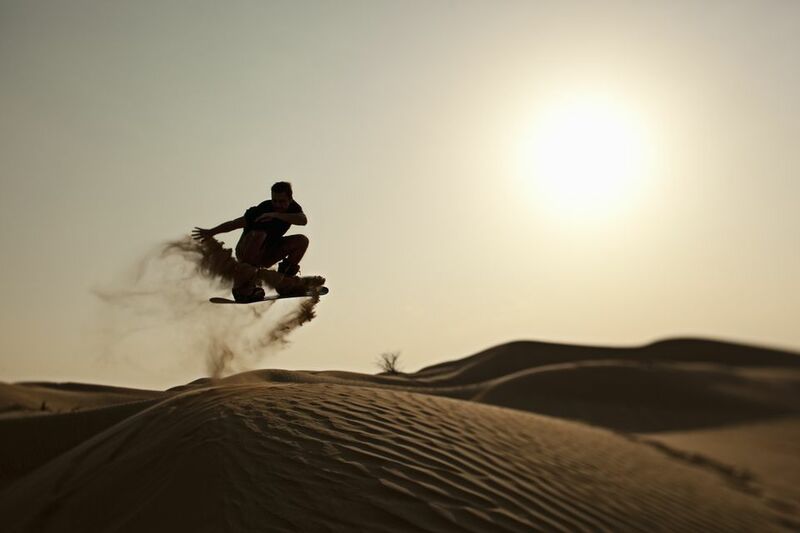 By morning, you can try out sandboarding — which is like snowboarding, but on sand dunes. Then, come evening, you can enjoy a multi-course Turkish dinner at Enigma inside Palazzo Versace (yep, the designer), or check into the St. Regis hotel’s leather-scented Bentley suite (yes, just like the luxury car brand). But this Middle Eastern destination also has two distinct distinct playgrounds for intrepid travelers: the bathwater-like Arabian Gulf and the rolling sand dunes, which are especially fun when the sun is setting or rising. Actually, make that three playgrounds. There’s a ski run, too. Head on out to this hedonistic destination while the weather is just right this winter. These 11 adventurous activities will pump your adrenal glands into overdrive. Consider this the warm-up for your adventure vacation. If you're a bit fearful of heights, being in a basket 4,000 feet above the ground can definitely make your heart race. But once you build up that courage to look out and take in the views, the ride becomes a zen experience. The sun just seems bigger as it makes its ascent over the sand dunes. Plus, you’ll get to watch gazelles blitzing across the sand beneath you. For your next trick, you can combine two superpowers into one: Flying and walking on water. First-time flyboarders, you’re in the capable hands of the team at Searide Dubai. At first, you’ll probably do more flopping than flying. But after relaxing your body and getting your footing right, you’ll be flying high. OK, the max height you can go is 30 or so feet up, but it feels like you’re on the top of the world. Pro tip: Make sure your sunscreen is applied at least an hour or so before you get into the water because salty water + sunscreen in the eyes puts a dent in your fun. Getting around Dubai is done in major style. Your Uber driver will probably pick you up in a Lexus, or even a helicopter. And if you’re flying in via Emirates first or business class, you’ll get a complimentary chauffeur to take you to and from the airport. Build on that luxury transportation theme and mix in some adventure by booking a helicopter to give you a tour of the city. You’ll climb aboard, buckle up, and put on headphones so you can hear your pilot point out landmarks during the flight. The adrenaline rush comes at takeoff when you launch from a helipad at Atlantis. During the course of your ride, you’ll get to take in a bird’s-eye view of Palm Jumeirah, a man-made island shaped like a palm tree. Picture a Go-Kart. Now, picture that Go-Kart taking flight and gliding through the air with the assistance of a parachute. Feel your stomach drop a little? This emerging adventure is more daring than, say, a helicopter ride because the open air is surrounding your metal cage. (A trained captain will chauffeur you through the air, though). You could cruise up to 2,000 feet high, depending on the wind factor, and the speed is relatively slow at about 40 miles per hour. Bonus: You might even spot some giraffes and antelope herds beneath you. You can book para-motoring through SkyDive Dubai’s desert campus. "Anything is possible" is the recurring theme in Dubai, whether that involves engineering some of the world’s tallest buildings or re-imagining the hospitality industry to include a butler service on each floor of the Burj Al Arab Jumeirah hotel. Still, it’s surprising to find a winter wonderland in the middle of the desert. Well, let’s make that inside a mall in the middle of the desert. Ski Dubai has ski slopes complete with a chairlift, penguins that come out to play in the afternoon, and a sledding hill. But the most thrilling attraction? The bobsled that zips you down the chute and makes you wonder if you’d have a shot at competing at Pyeongchang 2018. No need to pack your coats and ski boots — Ski Dubai has all the cold-weather gear you’ll need. Cartier, Chanel, Tiffany & Co., and a shark tank. The Dubai Mall, which is the world's largest mall by total area, boasts the Dubai Aquarium and Underwater Zoo. From the mall, you can see sharks glide by. Or, you can purchase admission tickets and walk underneath the tunnels that they’re swimming in. But, if you dare, you can get up-close-and-personal with these predators during feeding time during the Shark Experience. Fret not, you’re safely enclosed in a diving cage while the aquarium’s shark feed divers lure the sharks toward the enclosure with buckets of fish so you can watch the feeding frenzy. Are you sensing a heights theme, yet? Jumping out of a plane for the ultimate free-falling experience is about as daredevilish as it gets. First-time skydivers, you can go tandem with Skydive Dubai, free falling at more than 120 miles per hour over the Palm Jumeirah Island. No experience is necessary because you’ll be tandem diving with an instructor. You may have seen the viral video of this water slide on your social media feed. The Poseidon’s Revenge slide, which is at Marine & Water Park at Atlantis The Palm Dubai makes traditional, straight down water slides look like they belong at the kiddie pool. You step into a capsule and wait until the floor falls out beneath you and you plummet through a tower, going 38 mph until you get flipped upside down. On a family vacation? You can still get a mini-thrill and an epic family photo by making your way to the top of the Burj Khalifa, an iconic 160-story building in Dubai and the tallest building in the world. Your ears will likely pop as you ascend up to one of the famed observation decks to get 360-views of the Dubai. The building features hotels, residences, corporate suites, and fine dining. Long beaches coupled with breezy winds makes Dubai a prime spot for kitesurfing, an extreme sport that is quickly gaining interest. It’s a combo of wakeboarding and parachuting and the assist of the kite allows the rider to do some cool, acrobatic stunts on the waves and above the water. Aptly named, you can get some great kitesurfing in at Kite Beach. Afterwards, grab lunch at Salt, a food truck with outdoor seating on the beach.